This morning while I listened to eulogies describing former British Prime Minister Margaret Thatcher as “A great Briton” and a patriot, my thoughts turned to my classmate Dorothy Mahaffy Steel, a great American and patriot. Like Thatcher, Steel knows what it like to be a woman in a traditionally male arena. 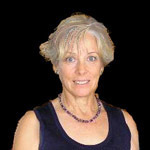 While many of us women in the Class of 1980 focused, at least some of the time, on breaking boundaries for females, Dorothy (Dee) completely focused on serving her God and country — and varsity gymnastics. After graduation, in addition to her own Air Force obligations and remaining active in gymnastics, Dee married a like-minded USAFA graduate and together they raised a family of patriots. On April 3, Dee made a sacrifice that she readily understood and accepted as part of her family’s moral code. 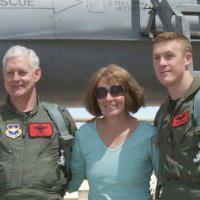 Her son died while landing his F-16 in Afghanistan. 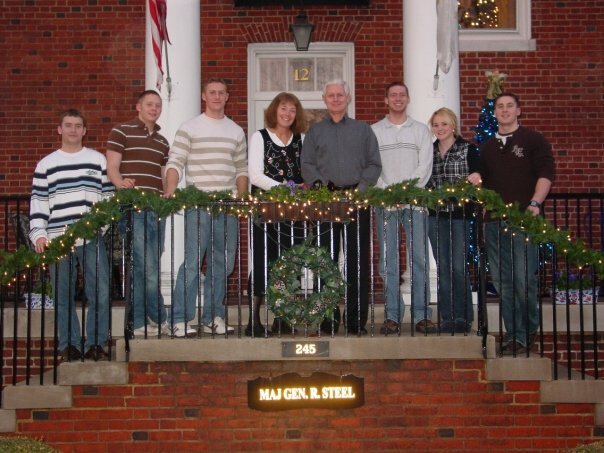 The loss of Captain James Steel, Class of 2006, is felt by a broad swath of AFA alumni, including everyone who knows James’ mother, Class of 1980; father Retired Major General Robert P. Steel, Class of 1978; James’ brothers (twin) Jonathan, Class of 2007, a C-17 pilot; Chris, Class of 2008; Bobby, Merchant Marine Academy Class of 2004; Paul, an Air Force Combat Controller (the guys who jump in with the SEALs, in addition to other missions); and James’ sister Michelle and sister-in-law Samantha. That is five Air Force Academy graduates and seven service members. Please say extra prayers tonight for this great American family. I know that some readers want to know more about the crash. The Air Force Times reported that there was no indication of enemy action, and that the incident is under investigation. I urge readers to wait patiently for the investigation results, which should take weeks to months. The F-16 is a reliable, but old, single-engine fighter, that Steel flew in Close Air Support missions — a demanding, sometimes low-level (low altitude) mission. The tempo (how often and how much flying is done) on both airframes and pilots in the last two years has been high. The crash occurred during a night landing, which is always challenging. Whether the aircraft was felled by enemy or other factors does not matter; Steel died during dangerous operations supporting his country’s military objectives. To Ms. Steel and family – it is not possible to put into words the grief you must all experience and endure…but as an American, I can definitely say his service to MY country cannot ever be thanked enough. My sincerest condolences. Our real heroes need to be honored here in private sector posts…as our media fails us tremendously. Thank you, Dorothy Mahaffy Steel. Please accept my condolences for the loss. Words never have meaning at times like this. I appreciate your son and his willingness to serve with honor and distinction. I also honor your family’s long standing history of service to the nation. With your permission, I would like to offer prayers for your comfort and I would like to notify my friends via my blog so that they may be aware of your family and your time of suffering. My condolences to the Steel family. The Steel’s, and families like them, are the backbone of our country. Thank you for sharing this story. And my gratitude and prayers are with them this evening. Thanks for this post. James and I were in the same class/sqdn at usafa. He was an amazing person and so deserving of honor. Praying for his family. My deepest heart felt condolences to you and your family. Yes, the ultimate sacrifice has been made, and I know the inspired legacy your son leaves behind will never replace him. However, I know this, remember he may be gone in body, but thanks to God’s love, your son’s love and spirit will last forever. I send my heartfelt condolences, I know there are no words to comfort. A family who serves us, deserves our thanks and prayers. I add my condolences and prayers to my classmate Dorothy as well as to her family. I continue to keep the men and women who serve in our nation’s military in my wishes for their continued prosperity and for their safe return. Dorothy Mahaffy Steel asked me to thank everyone who is praying for her and her family, and yes, you may share her and James’ story.